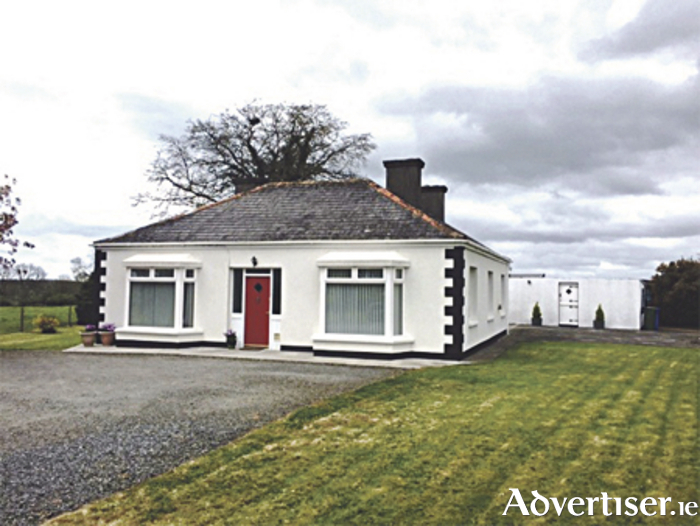 O’Rourke Brothers bring this charming detached property set amidst the tranquil countryside in Kilnacarrow, Ballymahon to the market. The property, located near the new Centre Parc development, is situated just 3km from Ballymahon town, the award-winning village of Abbyshrule, and Center Parc’s new development at Newcastle Wood. The home is in pristine condition throughout and comes with a heated summer house that is ideal for parties, as a play house for the children, a barbecue area, or simply as an escape for grownups to go to in order to get some down time. The summer house is fitted with lights, electric heaters and multiple power points. This deceptively spacious country property offers any potential buyer bright modern interiors with comfortable living areas. Beautifully presented both internally and externally, this home has been lovingly restored and recently extended. The current owners maintain the property to the highest of standards. Decorated in contemporary style throughout, the home is situated on an elevated site with a substantial mature garden and its own detached utility/laundry room. The accommodation comprises three double bedrooms with a master en-suite and walk-in wardrobe, a large kitchen/living area with solid fuel stove, modern kitchen units, patio doors leading to the garden and summer house, and a large, stylish family bathroom. Extra details include new electrics and plumbing throughout, a solid fuel stove with back boiler, an emersion water heater, zoned thermostatically controlled heating, attic access via Stira ladder, double glazed windows with insulated frames, and internal insulation in floors and attic. Both bathrooms are fitted with Triton T90Z pumped showers, and the detached utility/laundry room is heated, fully dry lined with ply, and insulated. Furniture is not included but if required the house can be sold furnished at an extra cost. The home enjoys a BER C 3 energy rating. For more information or to arrange a viewing call (087 ) 8240829 or (090 ) 6481237.